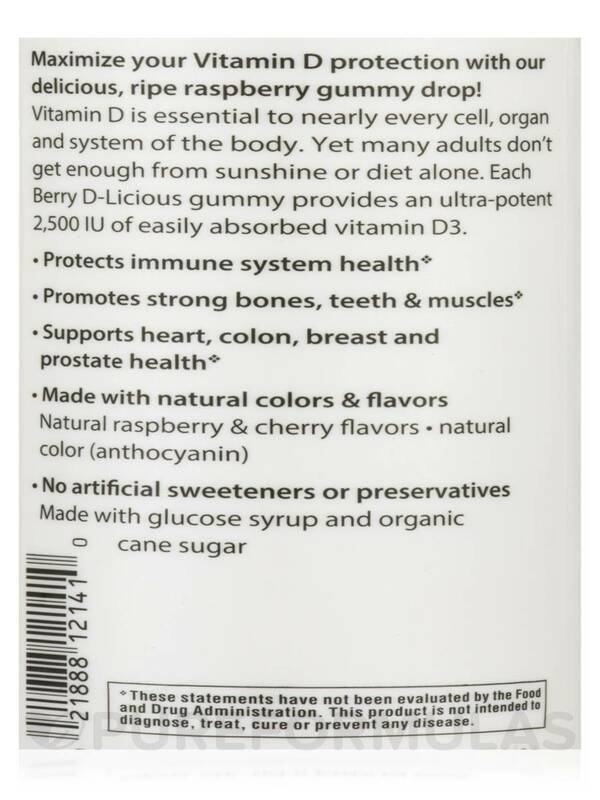 My 3 year old has no idea Berry D-Licious Vitamin D3 a vitamin. We love these! My whole family loves Berry D-Licious Vitamin D3 2,500 IU (Raspberry Flavor) by Rainbow Light.We love it! 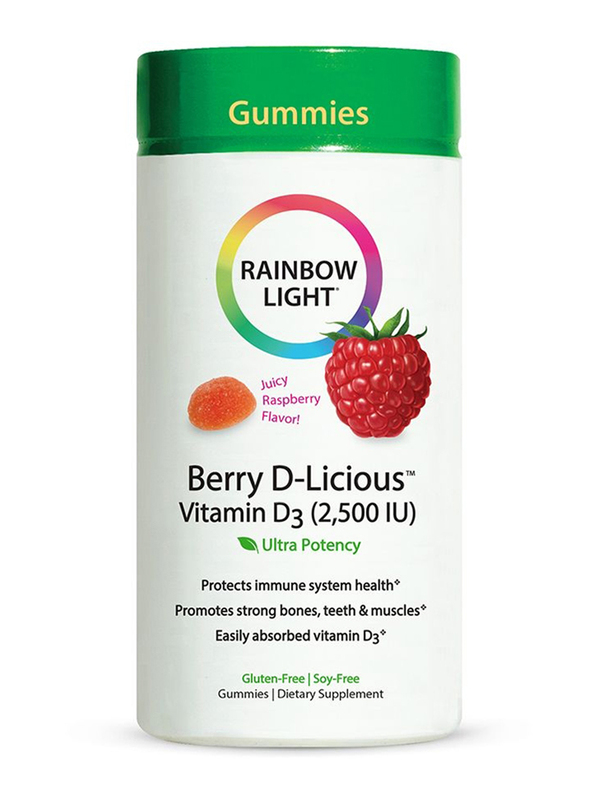 Strengthen your immune system and improve bone health with Berry D-Licious™ Vitamin D3 Gummies from Rainbow Light®. 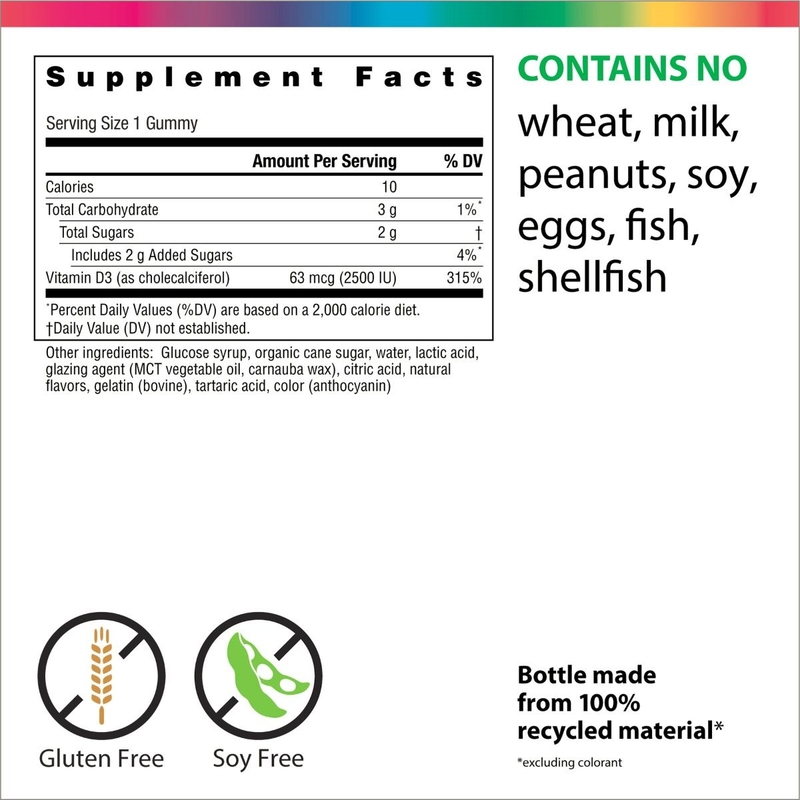 This dietary supplement is free of soy‚ gluten‚ eggs‚ fish‚ wheat‚ peanuts‚ milk‚ lactose‚ BPA‚ and artificial preservatives. 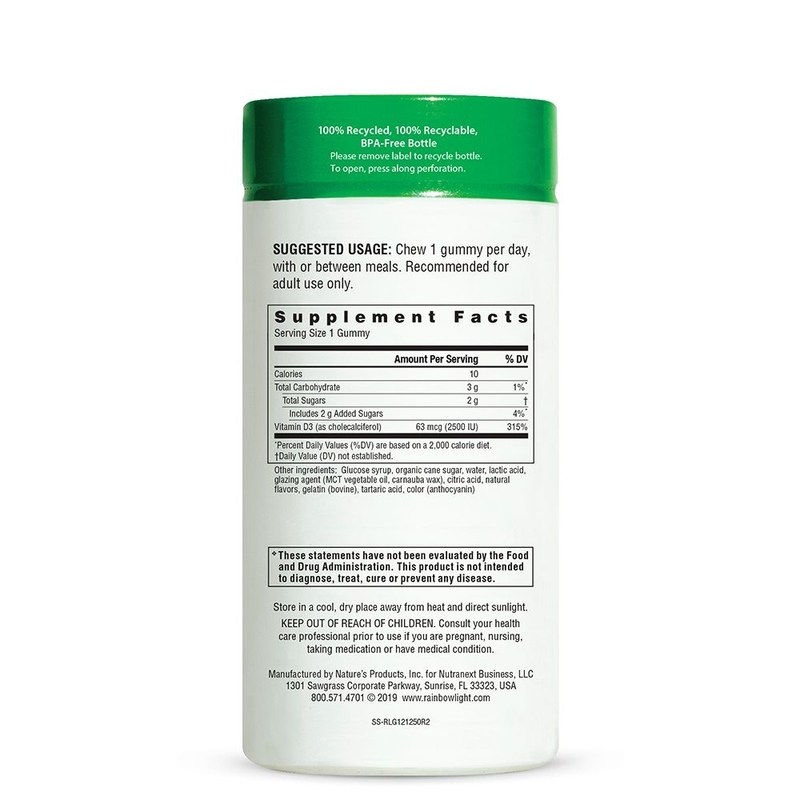 Vitamin D‚ as D3 cholecalciferol‚ helps your body absorb calcium and phosphorus more effectively and alleviates conditions related to bones‚ teeth‚ and muscles. It could potentially reduce joint pain and inflammation to support easy mobility. Vitamin D in this dietary supplement from Rainbow Light® may also inhibit the growth of harmful cells in your body and avoid associated conditions. Vitamin D improves insulin sensitivity in your body and supports heart health. 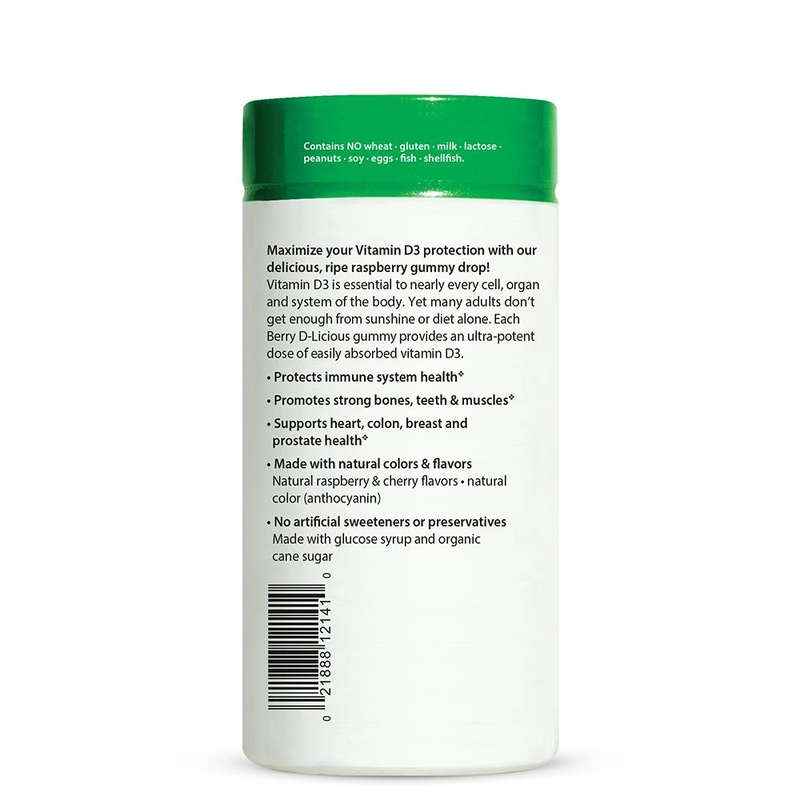 It could potentially promote your cardiovascular health‚ develop lung function‚ and fight infections. Incorporate Berry D-Licious™ Vitamin D3 Gummies from Rainbow Light® in your daily diet and it may also promote cellular health‚ improve muscle function‚ and support the well-being of your bones‚ heart‚ and circulatory system. Other Ingredients: Organic cane sugar‚ glucose syrup‚ water‚ gelatin‚ lactic acid‚ citric acid‚ natural flavors (raspberry‚ cherry)‚ tartaric acid‚ natural glazing agent (vegetable oil‚ beeswax)‚ natural colors (anthocyanin). Contains no wheat‚ gluten‚ milk‚ lactose‚ soy‚ peanuts‚ eggs‚ fish‚ shellfish. No artificial sweeteners or preservatives. Made with glucose syrup and organic cane sugar. Chew 1 gummy per day‚ with or between meals. Recommended for adult use only. Store in a cool‚ dry place away from heat and direct sunlight. Keep out of each of children. Consult your healthcare professional prior to use if you are pregnant‚ nursing‚ taking medication or have a medical condition. Berry D-Licious Vitamin D3 by Rainbow Light Great for adults who have a hard time taking pills. I like that each gummy offers a higher dose vitamin d than most other gummies. The raspberry flavor is delicious, and the gummies are easy to chew. I will definitely continue to reorder these! Love the flavor of these gummies! At a recent visit to the doctor, I was informed that my Vitamin D level was "deficient". I ordered Berry D-Licious Vitamin D3 2500 IU by Rainbow Light because of the high dosage, but was pleasantly surprised by the wonderful flavor. I will definitely be re-ordering these gummies! Great flavor and dosage that meets my needs. I actually look forward to taking my vitamins now. I'm not too good with pills so I just love Berry D-Licious Vitamin D3 Gummies. Berry D-Licious Vitamin D3 by Rainbow Light taste great! Great for kids or adults who don't like pill forms. Berry D-Licious Vitamin D3 tastes good and lots of vitamin D. East to take!